While some toys are more difficult to find than others, almost everything and anything can be found and purchased (with a little patience, time, and - of course - money). The opportunity to own a true one-of-a-kind item seldom arises and, although the term "rare" is frequently used, very few pieces can truly claim to be something that no one else in the world possesses or has seen before. Most often, unreleased toys that have only been seen in photographs or prototype form and never saw the light of day on a store shelf are well documented and accounted for. Surely if such a toy did become obtainable, the cost of owning an item would be considerable at best - but more than likely unaffordable to most. As it happens, such an action figure that was thought to not exist previously did become available recently and to procure it, you just needed $25, to be in the right place at right time, and know what you were looking at. 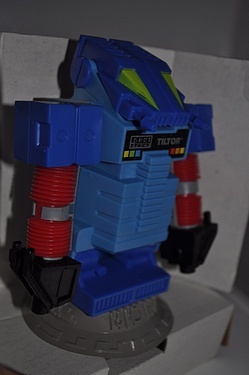 The toy in question is Tiltor, one of the unproduced second wave figures from Ideal's Robo-Force line. 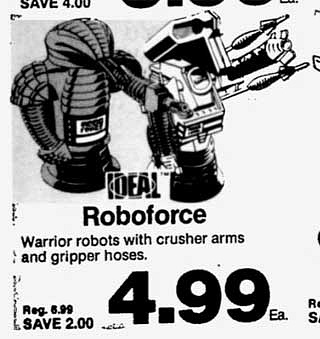 When Ideal released Robo-Force in 1983, they couldn't compare to the Transformers that came out right after them. When the line was quickly canceled, children of the 80's really missed out on one of the greatest and certainly most underappreciated robot toy lines ever created. Robo-Force is actually the descendant of Ideal's 1960's toy line, the Zeroids, with a heavy influence from the design of the Daleks from "Doctor Who". 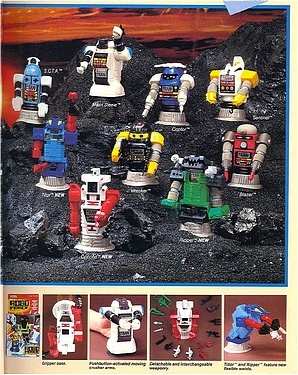 While many look at Robo-Force and see lame, antiquated looking robots that couldn't compete with the awesomeness of Transformers or the semi-awesomeness of the Go-Bots, everyone overlooked the fact that Robo-Force figures transcended all action figure lines of the day. Action figures that came out in the 1980's were all over the map in terms of articulation and scale and many children found crossing lines to be difficult. Star Wars figures and GI Joes were virtually the same size as one another but the articulation wasn't the same and they didn't fit well in each other's vehicles. M.A.S.K. cars were too small for other action figures to use and He-Man was a behemoth among them all. Transformers got along just fine with Gobots but next to a 3 3/4" action figure, they were ridiculously small. Robo-Force figures however, knew no limits to what they could interact with. They could be robots Man-At-Arms & Tri-Clops created in Masters Of The Universe, large droids from the Star Wars galaxy, a massive army of iron giants used to fight Cobra's battles against GI Joe or even the Transformers less-articulate cousins from Southern Cybertron. While Maxx Steele certainly got a lot of face time on various products from wrist watches and alarm clocks to bed sheets and telephones and even had his own dedicated fan club, there was no movie or weekly cartoon to mold kids' logic into the rules of the universe in which he lived in, so the potential for crossover adventures was virtually limitless. Sadly though, no one really saw this potential and the line was here and gone in the blink of an eye. Oddly enough, most kids had at least one Robo-Force figure growing up (probably Maxx or Hun-dred) and many of them ended up in their toy box in one of two ways. In the first scenario, a child would have a birthday party at Razzmatazz or the less-cool Chuck E. Cheese and invite school friends that would have to show up with a gift. If the kid attending the party didn't know the birthday boy too well, that gift was most likely a Robo-Force action figure because after their cancellation, Robo-Force toys were on perpetual clearance for the rest of the 1980's. The second way many kids had these figures was a direct result of the line being canceled. Since these figures spent an eternity warming pegs in the clearance isles of department stores everywhere, they were affordable to children shopping for a new toy with only a few bucks in their pocket. Before the abrupt cancellation of Robo-Force, Ideal planned to release a second wave of figures and vehicles and even included pictures of these upcoming toys in their 1985 toy catalogue. 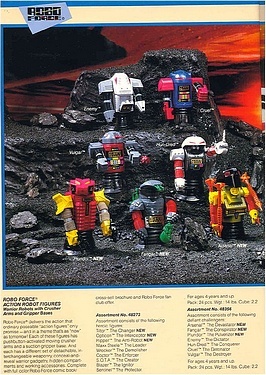 These Wave 2 figures also appeared along side the first ten Robo-Force robots in the 1984 Ruby Spears cartoon a year prior to being featured in this catalogue. The cartoon is something of an anomaly itself as only one half hour episode was ever aired. For the most part, after the photo sappeared in Ideal's Toy Guide, it was the last anyone had ever heard of them. 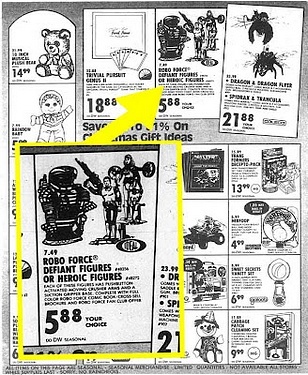 Collectors have speculated that maybe the Wave 2 figures were released after the line died but the only evidence to support this theory could be found in old weekly flyers from department stores. The website, The Vintage Space Toaster Palace, is dedicated to cataloguing these old ads and it is there that the only known evidence that these figures might have been released is found. 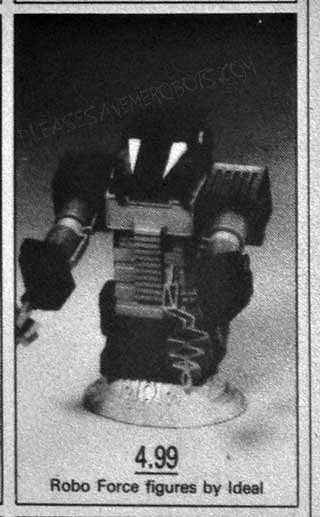 Basically while researching a catalogue from a department store called The Broadway, robot aficionado, Steve De Anda, who runs The Vintage Space Toaster Palace, discovered their February 20th 1985 weekly ad featured an actual photograph of one of the second wave figures from the Robo-Force line. The theory was that in order for Broadway's Department Store to feature this unreleased figure in their ad, they had to have the actual figure in their possession to take the photograph. The only other evidence of these figures release appears in line-art form from a Dart Drug ad in December of 1985 and an ad in Washington's Tri-City Herald in May of 1985. However, line-art is made in advance to send to retail stores to showcase upcoming toys that the company plans to release and is not always accurate to the toys that were actually made. 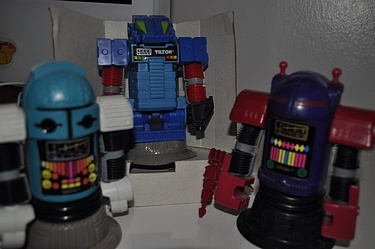 Also lending to the argument that these toys never saw the inside of a retail store is the simple fact that in the almost 30 years since the demise of Robo- Force, no one has come forward to say they have any of the unreleased figures in their collection or even have childhood memories of playing with such toys at one time. 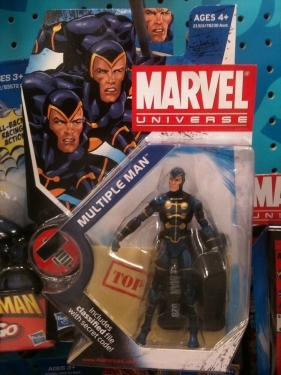 The whereabouts of the Wave 2 figures used for Ideal's catalogue are unknown as well. It's doubtful they've even survived through the years. 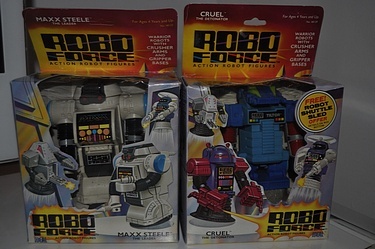 On May 2, 2012 an auction titled "1984 Ideal Robo-Force Cruel The Detonator New In Box-Never Opened" was listed on Ebay. 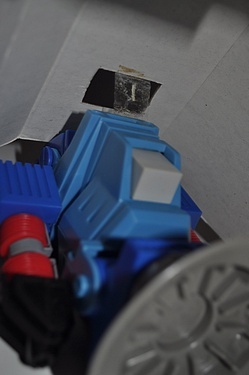 While this figure is by no means difficult to find, the thumbnail picture next to the title showed that the robot inside the box was not the purple and maroon colored Cruel, but a rectangular blue and red robot. When the auction listing was clicked on to get a better look, what followed was a moment of recognition mixed with disbelief and an inability to swallow coupled with trembling hands. 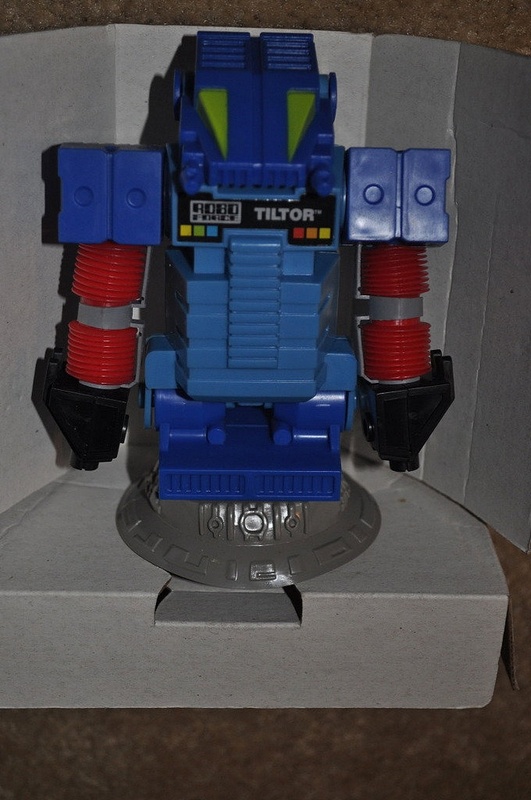 Sitting before me was Tiltor, a Wave 2 unreleased and never before seen Robo-Force Action Figure. The auction had only been on for a short time and for a Buy It Now of $25 amazingly no one else had snatched him up. Typing at lightning speed, the figure was purchased without hesitation. The seller was actually located a mere twenty minutes down the road so the following day, I had arranged for an in-person pickup and drove to get him. The night before, I actually stayed awake in bed worrying the seller was going to contact me and say someone had made her a better offer on the figure or worse tipped her off to what she had. Thankfully nothing like that happened. As it turned out, the lady selling him knew nothing about the figure. She had gotten it at an estate sale some two weeks prior to putting it up for auction. To her, it was just an old toy someone had stashed away; a forgotten action figure that had survived through the year and was never given to a child to open and play with. To the woman selling me this impossibly rare toy, it was a quick $25 in her pocket. It is pure luck that he remains in perfect condition today and while this is a huge discovery, it raises even more questions about the Robo-Force line. After getting the figure home I went over every inch of him to insure the most accurate and detailed description possible. 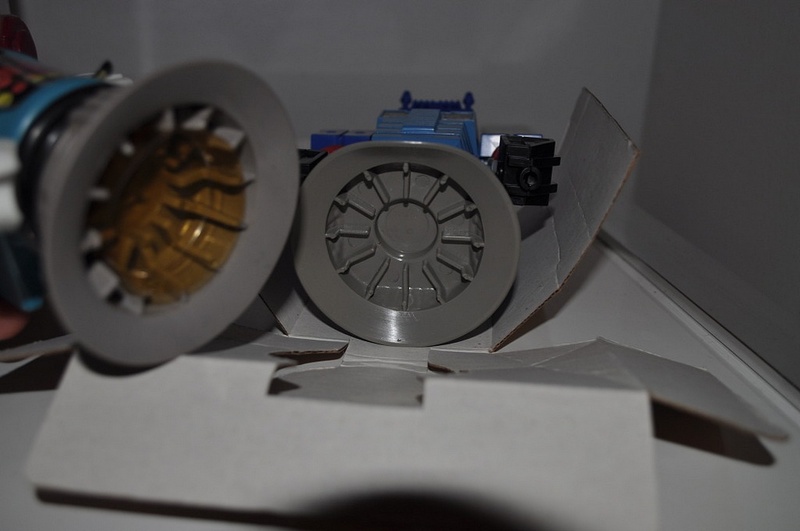 The first thing to notice about Tiltor is he's not in his own box but rather inside Cruel The Destructors' packaging. There is no mention of the Wave 2 figures anywhere on this packaging. Tiltor was sealed in this original box but the side tape had lost its stick due to age and the box could be opened easily from the side. At first I wondered if he was simply placed inside the box however, after thoroughly examining the figure and packaging it was apparent that he did in fact leave the factory as Ideal intended and had not been out of his box since doing so. 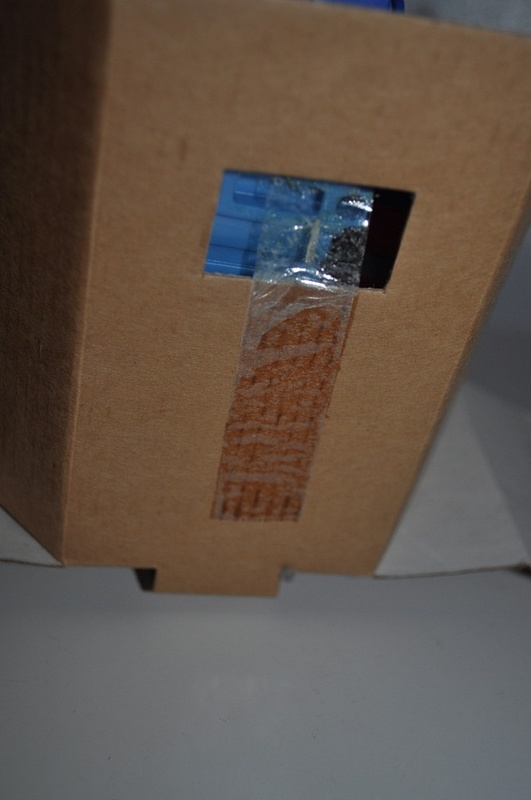 The tape on the side was not cut nor peeled away from the box and it is clear the glue had simply dried up. The figure is also taped to the inner cardboard backing and because this tape has not dried out and is still connected to both the figure and cardboard insert, I did not remove the tape. The tape that holds him to the inner cardboard is more proof that he was packaged in this box and was not merely slipped in after the fact. 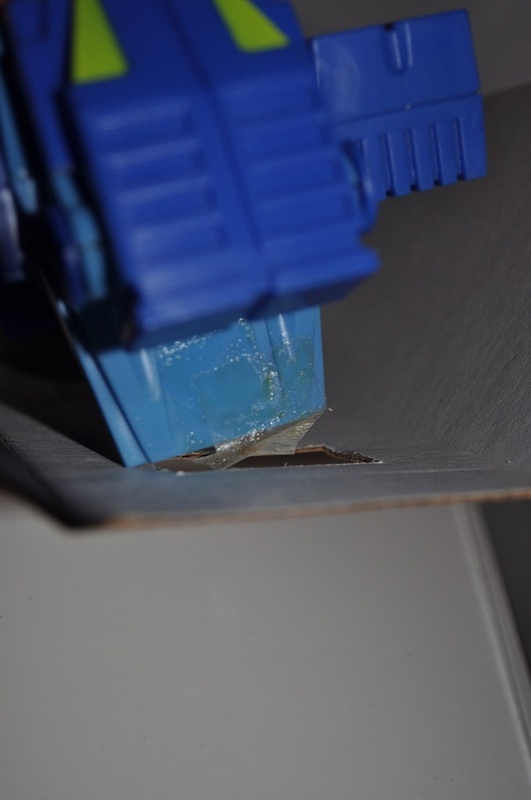 Having the tape stuck to his back did leave some minor discoloration on the plastic where the tape resides and is further evidence that it has been there for almost thirty years. It is also the only flaw on this otherwise perfect figure. The box itself does not have a price sticker on it. If it did, it would be an easy answer to the origin of the figure. If anything, it leads to more speculation as to where this figure came from. The Broadway, the department store that ran the ad featuring the photograph of Tiltor back in 1985, was exclusively a West Coast based department store and this figure was discovered and purchased in New Jersey. The Broadway was eventually bought out by Macy's and many of them became Bloomingdale's, a department store that was located on the East Coast, but this happened sometime in the mid 90's and it is highly unlikely that these stores stocked 10 year old toys at discounted prices. A more likely store for him to turn up in would have been the East Coast based five and dime store McCrory's which stocked Robo-Force action figures right up till the time they shut their doors in 1991. However with no price tag emblazoned across the box, the source of this figure will remain a mystery. To further complicate matters, Ideal Toys was actually located in Newark, New Jersey so it also needs to be considered that this figure may have come direct from the factory. 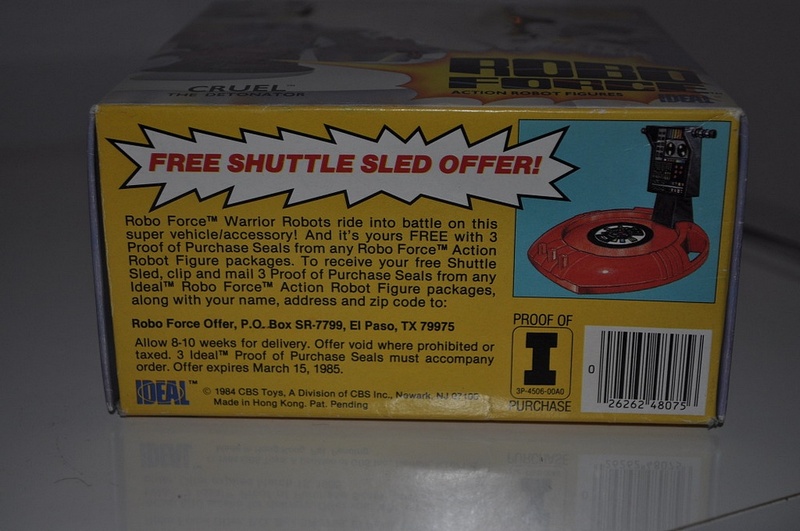 Another thing to note about the box is that this is the second version Robo-Force packaging being that it has the mail-away offer for a free Robo-Sled and it would make sense for him to come in this later edition box as well. 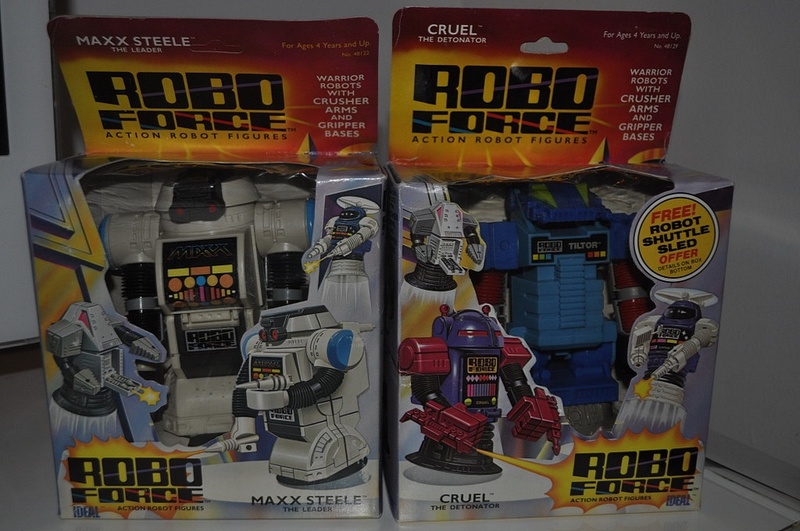 It could be argued that Ideal decided to ship these toys out in excess first series boxes rather than spend money creating new packaging for an already canceled line but a closer examination of the 1985 catalogue reveals there was a box created featuring artwork of three of the Wave 2 figures. 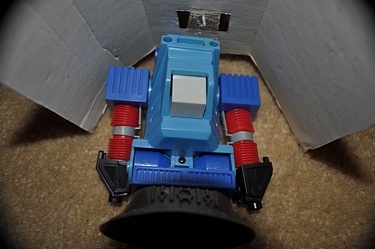 Upon removing the figure from the box, the original plastic shipping ring was still present and another indication that he had been shipped in the wrong box and had never been taken out. 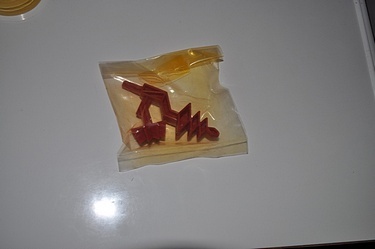 This piece of plastic, now yellowed with age, serves no purpose other than packing material and was designed to fit inside the suction cup base of the figure during shipping and be discarded once the figure was taken out for play. Like every other figure in the line, Tiltor comes with his own accessories that were produced exclusively for him. They are still sealed in the original packaging bag, which has also yellowed slightly over time. 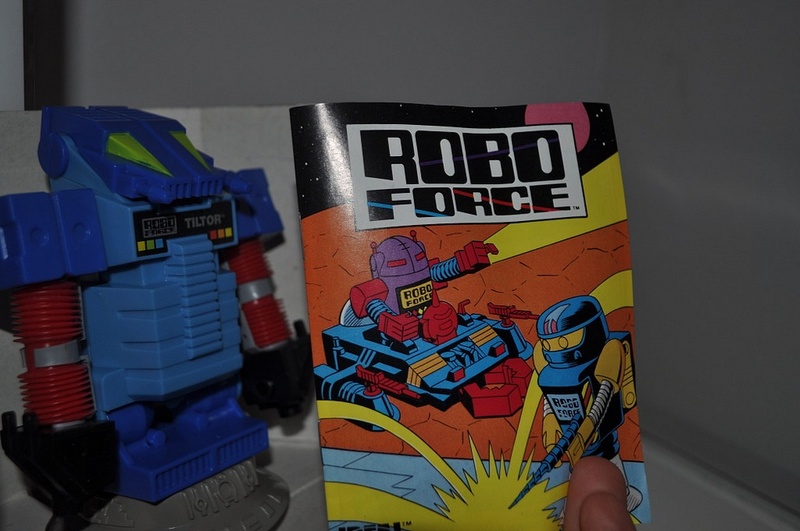 In addition to coming with accessories, every Robo-Force figure came packaged with a mini-comic. Although there are five known mini-comics, an overwhelming amount of figures were packed with "Assault On The Fortress of Steele" for some reason. Tiltor is packed with the less-common "Showdown In Space" mini-comic. Possibly the only disappointing element to this figure was that he did not include an undiscovered 6th mini-comic which throws a flaw into the theory that Ideal may have commissioned more issues of the mini-comic after the initial five. What is interesting about this figure is that aside from Maxx Steele, all Robo- Force robots were designed essentially the same to a degree. 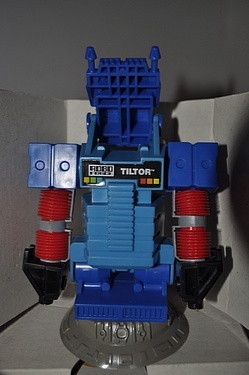 Tiltor however includes features none of the other robots posses. First, he "tilts" at the waist. 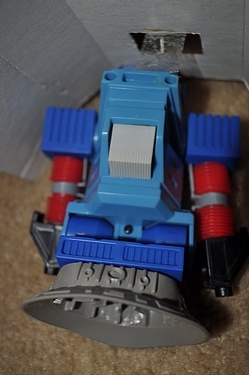 His head also flips up similar to Hun-dred but without the hideaway laser eyes underneath. Tiltor's hands are also specific to this figure as well as the bright red plastic used for the arms. As mentioned before, his base is much shallower than the other figures too. 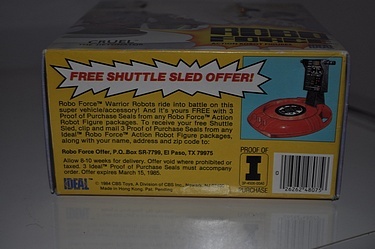 Some Robo-Force action figures came with instruction sheets on how to use a special feature or reveal a secret compartment the figure might have. 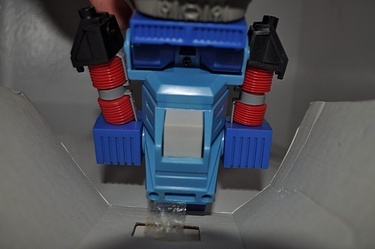 Tiltor's special feature is bending at the waist and no instruction sheet was included with this figure. Since no sheet was included in this box it is still unclear if Ideal intended to include an instruction sheet for him. One other variance between this figure and the others is that all of the Robo-Force figures, including the ones in the second wave figure, have matching color shoulders and hands. The only exception to this rule happens to be Tiltor and his counterpart, Ripper as seen in Ideal's 1985 Toy Guide. Tiltor also has a chest decal quite unique to him too in that it is smaller and custom fit to him where other figures all used the same interchangeable square chest sticker that bared their name. On his back, Tiltor has some screws that are bulky and exposed while the other robots had deep holes on their back where the screws would be inserted and unseen once in place. 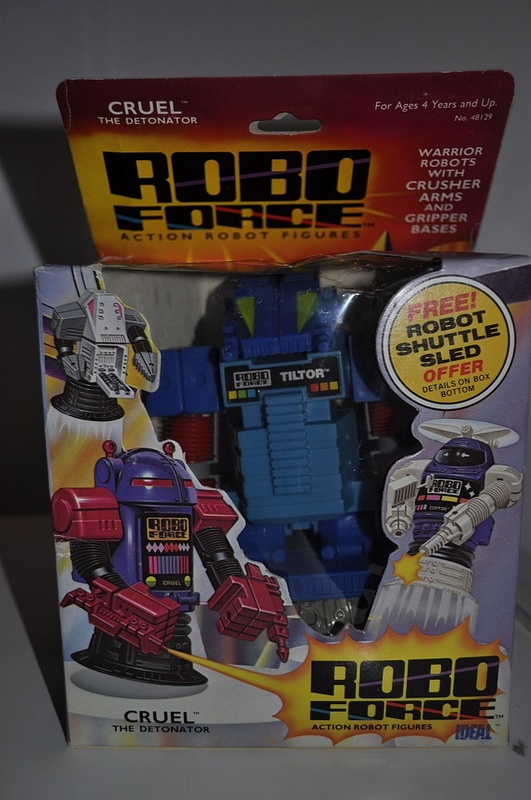 The last major difference to mention is that all Robo-Force figures have copyright information located just below the button on the back of the figure that activates the arm mechanism. After going over this figure extensively with a magnifying glass on two separate occasions, Tiltor has no such copyright information stamped on him at all. Considering how toy companies had a need for branding their licensing and logo information into their product, it does raise some questions as to why Tiltor has none stamped onto him. When this Tiltor is compared to the one in the Ideal Catalogue and in Broadway's, it appears that neither of them are this exact one. The figure photographed in the Ideal Catalogue differs from this one in several ways. 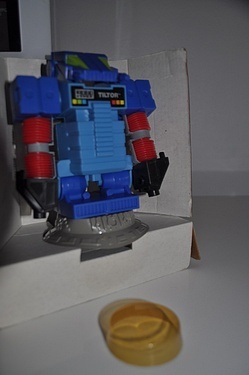 The suction cup base in the photograph is the standard base every Robo-Force figure came with. 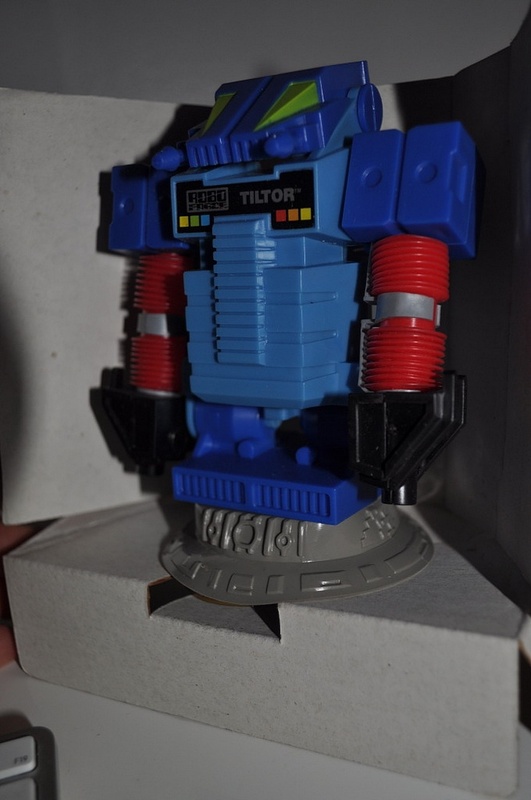 However, John Kent of Toyfinity.com pointed out that since Tiltor and Ripper were a different design than all the other robots, using this base would cause the figure to become too tall to fit in the standardized packaging box common to all of the figures. Rather than create a separate larger box to house the toy in, Ideal's fix to this problem was to create a base that was unique to these two figures which explains why Tiltors base is shorter than the rest. Also the Ideal Catalogue shows the Tiltor in the photo to have red arm straps where the one that turned up on ebay has gray arm straps. The photo from the Broadway also differs from this figure in that while it has the correct squat suction cup base, the chest sticker is missing from the figure. Since that picture is taken in black & white, it is impossible to tell what color arm straps that figure had. After reviewing all the facts and evidence, sadly the origin of how this figure came to be may never be known. What we do know is that this is not a prototype/ test shot that was mistakenly shipped out since the base in the photo differs from the actual toy and none of the paint on this figure was done by hand. It would also be highly unlikely a prototype would be packaged exactly the same as a production figure. 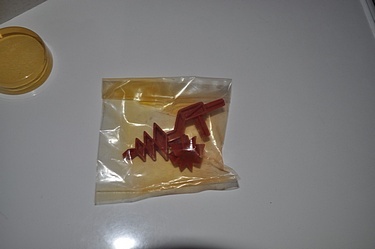 It is possible this is a salesman sample although there is usually a marking on the box (most often in the form of a decal) stating that's what it is to prevent someone from reselling it. 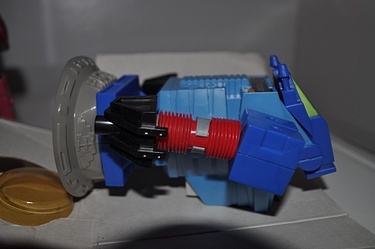 It also wouldn't make sense given the fact that he is not in his individualized Wave 2 box, which from the catalog photo, Ideal had begun working on. Also, if Ideal needed someone to see these figures in person in order to sell them, they could have easily chosen one of the already produced figures to use as a physical example. Most likely, this is how Ideal intended the completed version of the figure to look. It is a factory-made final version of the figure minus the copyright stamp Ideal surely would have included once the figure went into mass production. A fair assumption would be he was being used as a test package to see how the figure would sit and look after it was placed inside a box with the corrected base prior to commissioning large quantities of a box specifically for this figure. Somehow it was taken out of the Ideal offices, made its way into someone's home and was never intended to be given to a child in the first place. If this is the case, it still does not prove any of these figures were released in a large capacity and despite this Tiltor being a figure direct from the factory, there is strong evidence to support the theory that these toys were never sold at retail. It should also be noted that although eight figures were planed for the second release, the only known figure to appear in a photograph outside of the 1985 Ideal Catalogue is also the same one to turn up in person years later. Whether or not more than one of each of the remaining eight figures from Wave 2 was created still remains a mystery as well. After thorough research and close inspection the discovery of this figure actually poses more questions than it answers. The good news is we now know that at least one of these figures was made and somehow survived intact and virtually unnoticed for almost thirty years. 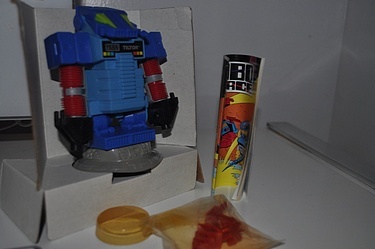 It also took a detailed examination of this figure to truly realize what a shame it was that Ideal abandoned the Robo-Force toy line so quickly. While these toys are simplistic in nature and can easily be dismissed as dated, their overall design is an underappreciated work of art. 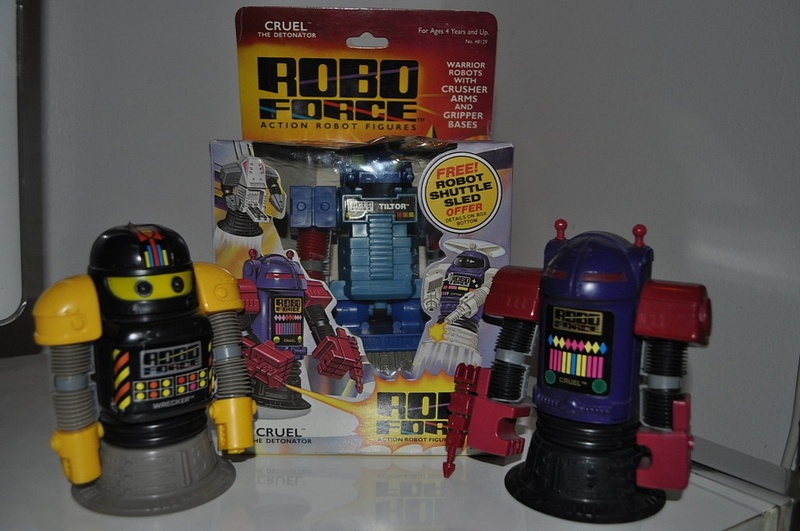 From their bold color schemes to the suction cup bases, to the boxy bodies and crushing arm action feature, Robo-Force robots are a look back at what robots used to be. In no uncertain terms is it an exaggeration to call finding this Tiltor a major revelation in the toy world. He is a forgotten piece of history; a glimpse into what could have been and what never was. It also makes you wonder what else is out there just waiting to be discovered.